Counting down the days until Christmas on a traditional advent calendar is exciting: opening a cardboard door to uncover a piece of Santa-shaped chocolate, or perhaps a marshmallow snowman. But let’s face it, there are better things in life than cheap milk chocolate and stale marshmallows to make you merry. Drinks by the Dram brings you an advent calendar that makes anticipating Christmas way more interesting… and boozy. 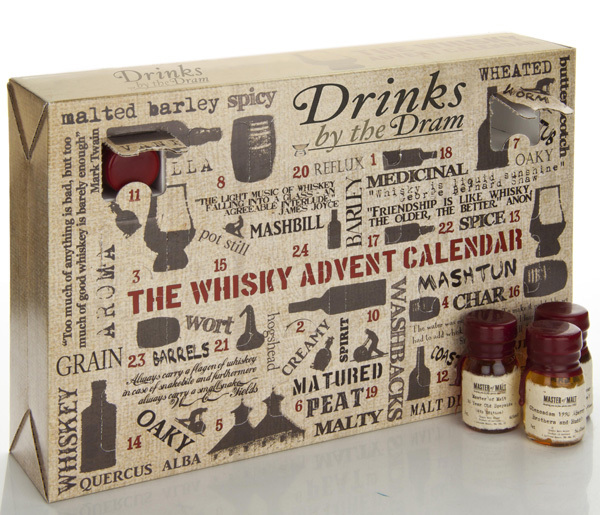 Each of the 24 doors on the aptly named Whisky Advent Calendar hosts a different 3cl sample of tasty, divine whisky. How amazing is that? Christmas and whisky, finally united! The contents in each little bottling are a surprise, but what the liquor retailers have revealed is that behind one of the doors is a sample of single malt scotch whisky that has been aged 50 years. The full size bottle of this grandaddy retails at approximately $560 (£350) so a little sample of it is perfect enough to please the jolly tippler in all of us. The Whisky Advent Calendar retails for approximately $240 (£150) and is now available online.